Haben Sie deutsche Muster nähen? I’m part of a Facebook group that takes foreign language sewing patterns & does sew-alongs for the members, translating the instructions to English. This way, all if us English-speaking folk stand a chance against the nightmare that is trying to remember what the words on your pattern piece actually mean after you’ve lost your translation key. Why didn’t I just write the translation directly on the printed pattern, you ask? Yeah I’m not really sure. Because you weren’t here to think of that for me? Or because sewing & pattern piecing usually happens after 10pm in our home and I don’t actually function at that time? Really it’s a miracle this sweater doesn’t have 3 arms. Anyways, even though I’m not really sewing in German, and I still have no idea how to speak German, I am very proud of this accomplishment. But you also need to ignore that someone had translated the instructions to English for me, because that doesn’t make it sound as cool. 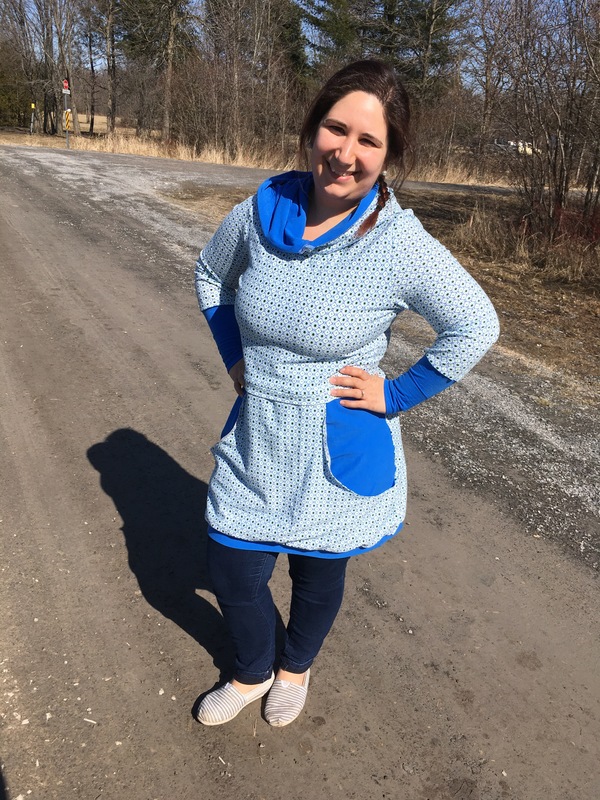 This time I made the tunic length because we’re between the seasons now and I always want a sweater dress at this time of year. Being short means I didn’t have to add any length to the pattern to make a dress. In fact, wanting a dress actually saved me the work of having to shorten it to fit properly. Win! I did the nursing mod AND a Full Bust Adjustment (FBA) according to the pattern’s directions/photos. The entire time I kept thinking this wasn’t the right way to do a FBA & wouldn’t really turn out properly since it only calls for added length, with no adjustment to width, arm scye, or hem. Now the “under bust” of the shirt sits at my natural waist rather than under the bust, and at this point it’s easier to make a new one with a proper FBA than to rip this one apart. BUT the nursing mod works, and really that’s the important part! 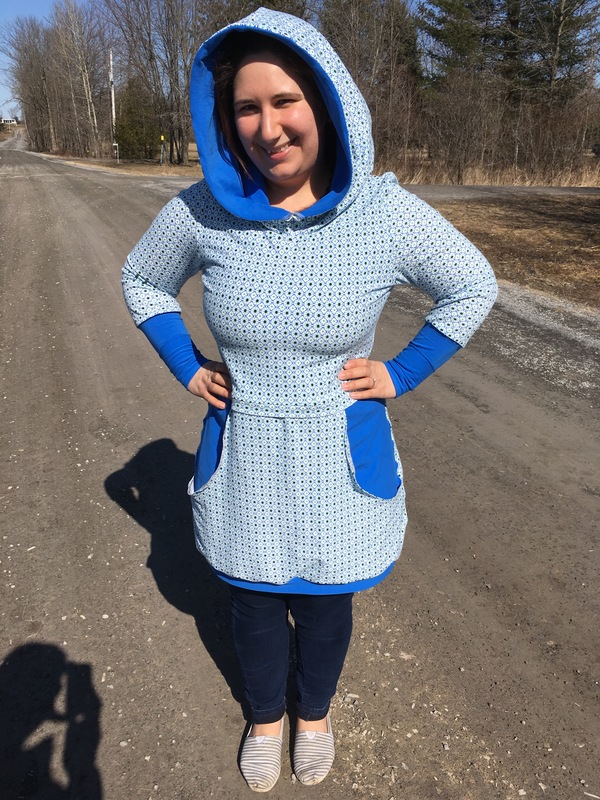 I also chose to do the “large hood” option, rather than a cowl or the “regular hood” – but I didn’t understand just how large it really is! My husband says it makes me look too Middle Eastern (ummmm…but I AM Middle Eastern, so I “look” it every day?!). I like to think of it more Red Riding Hood or gypsy style. It’s still gigantic no matter how you phrase it, so lesson learned & I’ll do the regular one next time! My husband makes an appearance in this one! Or at least his shadow does. Hi honey! The fabric was a Fabricville find (95/5 cotton/spandex), though next time I’d rather try a bamboo French Terry or another soft, cuddly fabric. And maybe this fall I’ll be brave enough to give it a go with a stretch fleece! In the end, I’m happy with the pattern & the final product, but there’s still more I would change for the next time. 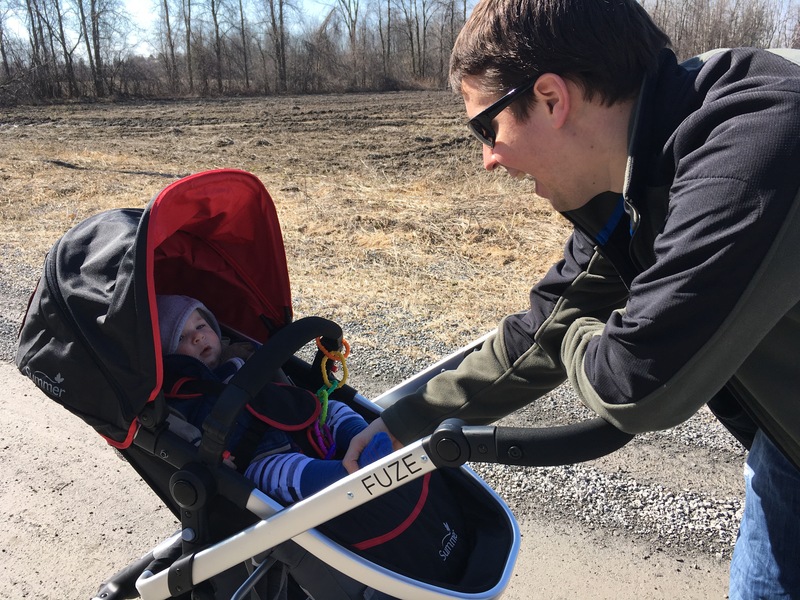 For now, it’s perfect for a spring walk with #BabyRydz & his papa!